These two collections are printed back-to-back and include an essay by Matthew Jarvis, who has written a full-length study of Ruth Bidgood in the Writers of Wales series. Bidgood is the outstanding poet of mid-Wales, ‘remote, solitary, trackless’, where there is so much less to distract the mind from eternal questions than there is for city-dwellers, forever bombarded by trivia. This is a landscape ‘always beautiful, rarely benign’, where ‘winter seems the only natural season’. 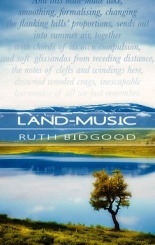 The Black Mountains poems, which have been published in earlier collections, draw on the same subject matter. ‘The old families are passing, almost gone’, houses are ruined, churches empty, hillsides scarred by industry and the light railway which serviced the Grwyne Fawr dam torn up. This is a little-explored region which I know well, but the reader doesn’t actually need to have been there. “Macnamara’s Mistress” is a particularly cold, impressive poem, in which a woman waits without much hope for her lover to take time off from his wife and ride to her isolated home across the mountains. It’s snowing; she knows that he won’t come this time. She gets drunk on the wine prepared for him and ‘sags into black sleep’, feeling that she is obliterated and that no one will ever know her story. But here the story is and we can all relate to it. Darkness is a powerful theme, as in earlier collections, and “Happy Ending” suggests that ‘the dark’ may not after all be our ‘destiny’. “Enigma” speculates on what happens ‘when the brain drops into death’; do bits of it float free? They can certainly survive in the form of what we now call memes, but a happy ending is more doubtful. We can continue to wonder as we admire this superb book from a writer now in her tenth decade.